First, I'd like to ask if anyone knows if we'll be able to have this item past the event. I want to add this to my collection that includes "Totem of Spirits". Second... oh I guess that was all I had to ask. If you destroy the board, will you be able to get a replacement? You can't put this in your bank and complete the quest and keep it. It deletes it from your bank. The quest ends abruptly with some lame "pat on the back" type speech from Garrosh. You get nothing out of doing the quest other than lore. I'd suggest not turning this quest in and just keeping the sign. I regret that I didn't keep the sign. Does anyone know what the board says? "GMs do not know whether you can keep this item past the Cataclysm. Only the Devs know and they will not tell." Wearing this, can the enemy faction see you whilst stealthed? I have not turned in the quest, as previous said. The signs on the sign (derp) look a lot like japanese. Anyone who can say if it's actually japanese, or just some random made up stuff? If you drive a mechano-hog while wearing this your upper body will act like if you were standing. If you don't turn in this quest to try and keep the board, can you progress with the quests when the next phase begins as normal. Or do you need to complete them all like in a quest chain? Its worth a shot to try and keep the board and not finish phase 1 quest chain as everyone says it ends quite unimpressively, but Id also like to complete the other phases' quests. This item is also secretly soulbound. I attempted wrapping it in Red Ribboned Wrapping Paper to the error of "Bound items can't be wrapped." 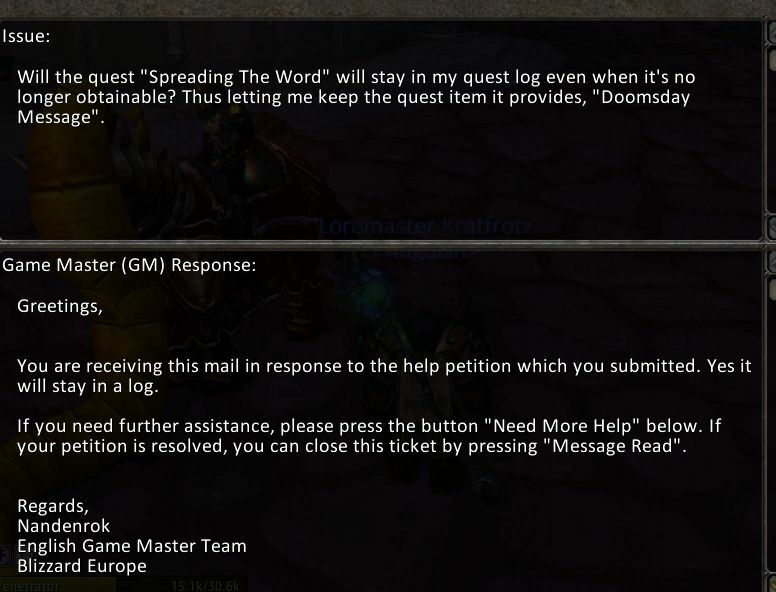 So I asked a GM about it, he responded that the quest will stay in the quest log. Pic (grammar error on my part, I know). But to be honest I wouldn't trust that response completely. Do you still keep it if you drop the quest? Like with Dartol's Rod? I think the devs really dropped the ball on this one. This is easily one of the best dress-up items in the game. Edit: Looks like this hasn't been reported yet, but you can actually see the front of the sign if you zoom all the way into "first person" mode. If you look down just a bit you'll find it hanging there in mid air, bobbing around as you run. Wear this as a Brunnhildar challenger (under Lok'lira's Bargain) and it ends up sideways. As a second note, this appears while you are dead. So chinese farmers can represent, while doing there thing! i'm not turning in the quest so that i can keep the board. its a sandwich board on ur toon and as well gives u a buff icon that reads "Doomsday Messenger Wearing a large board emblazoned with a message about the impending end of the world." i'm not turning in the quest so that i can keep the board. its a sandwich board on ur toon and as well gives u a buff icon that reads "Doomsday Messenger Wearing a large board emblazoned with a message about the impending end of the world." much like , more of what makes it awesome is the "best in show" buff. i'm not turning in the quest so that i can keep the board. its a sandwich board on ur toon and as well gives u a buff icon that reads "Doomsday Messenger Wearing a large board emblazoned with a message about the impending end of the world." much like Precious's Ribbon more of what makes it awesome is the "best in show" buff. would be so awesome if the message was in english and read "THE END IS NEAR"
The item is gone, no longer in my bag. But I still have the "Doomsday Messenger" buff and appears to still be wearing it. So if you have the buff still, NEVER CLICK IT OFF! EVAR! It just changed form non-slot occupiying item to a cloak with ilvl 1 whats a bit sad. Still have mine today, on my warrior, to afraid to move it, but badly want to play him. oh well. ;D lets see how long I can have it on him. still have mine also. kind of upset people are having it disappear. oh well. I checked here before questing in MoP on my toon with this to try to figure out if there were any dangers of losing my board, and found nothing. I just lost this on my character tonight. I'm a bit devastated, especially after having it during all of cataclysm. I had it on two characters, but lost it on one during what I suspect was the "The Battle For Crusaders' Pinnacle" quest in Icecrown. Tonight I lost the other somewhere during the first few quests in the Jade Forest. After leaving the Temple of the Jade Serpent I had queued for, I noticed it was missing. I'm not sure if it disappeared during the dungeon or during one of the quests that I was doing, which were the Pearlfin Jinyun (alliance) quests. Much luck to my Sammich Board Brethren. May you find a way to keep your board through this xpac and on to others. Personally I see it as a mild blessing as the character I had it on was a gnome, who I have always contemplated race changing but was afraid I'd lose my board if I did. I still have mine. It survived a race change (doesn't look good on panda, too fat), server transfer and zoning into challenge mode. I posted a screenshot. GM's have said they won't restore it if I lose it. The day I lose mine I will be a very sad panda. 7/12/2013 patch 5.3 and still have mine on my dwarf rogue. I've played it a ton since Cata dropped but haven't done arena which I heard is what can remove the buff. Maybe I'll post a screenshot. Still hording mine on my auctioneer/banker. Updating here that I died when I accidentally landed in the middle of the Headless Horseman burning the inn event. Was so mad I thought I lost it, but fortunately someone rezzed me and I still have it. I'm not sure if I would have lost it if I released. Does anyone know if it survives death? Still wearing the placard as of September 2014. A little update, since I didn't see it mentioned, as of 6.0 there is no longer a buff shown for having the board. You have the board on, but you no longer have to worry about accidentally clicking off the buff. So, that's cool. As for what happens when a character with it dies now, I don't know. It's on my bank alt. Been leveling her carefully since pre-Cata. She died once in Mists but didn't lose the board since I ran back to my body to res. Kinda worried now that there's no actual buff anymore. in legion, Auspice funeste is wearing the same! Still rocking this in Legion. Only problem is with the female body style changes to blood elf my breast shoot through the board. Now everyone is reading the sign! Équipé : Portez un grand panneau avec un message annonçant que la fin du monde est imminente.